The website ‘Abani Chakravarty’ is the latest offering of ‘Kabita Prakashan’, the humble publication enterprise that the poet himself started. It was devoid of any profit motive. We hope this site will bring the works of Abani closer to the new generation as well as literature enthusiasts, students and readers from any part of the world. The family of Abani Chakravarty has been celebrating the birth anniversary of the poet every year through publication of his original works and their translations, literary meetings etc. 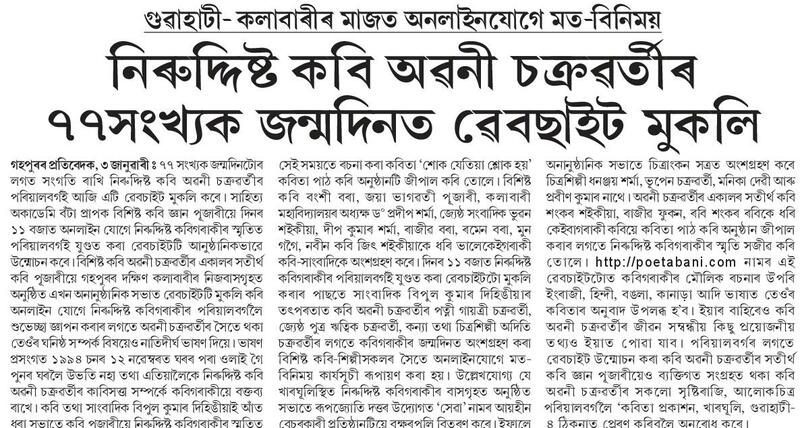 Various organisations too have been holding programmes in different parts of Assam to pay tribute to the poet. We appeal to them to give us the details of those programmes. The director duo Bhaskar Jyoti Das and Waribam Dorendra have made a film highlighting a part of the poet’s life. However, a compilation of the complete works of the poet is yet to be published. If anybody shows willingness to take up this work, we, the family of the poet, are going to extend all our co-operation for it. Abani’s poems have been translated into English, Hindi, Bangla, Bodo and Kannada as far as we know. We are yet to meet some of those people who were quite close to the poet. He visited many remote villages, regions and shared his views with his friends there. We appeal to those people through this website to contact us and send to us the poet’s photos, letters, unpublished works etc. from their personal collection. Even photos of those will do. If anybody wants to publish any work of the poet from this website, a written request has to be sent to the email addresses mentioned in the contact section in this site. We do desire for a proper dissemination of the poet’s works and good translations too. Hope, through this website we will be able to take up new projects in future.